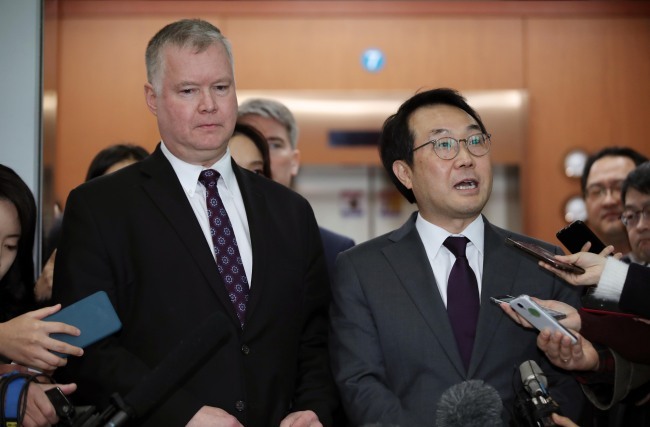 South Korea and the US agreed Friday that a groundbreaking ceremony for the modernization and reconnection of inter-Korean railways should be held next week, with the US agreeing to waive sanctions for the event. The US apparently decided to support the Koreas’ project to recover 1950-53 Korean War remains as well. “Through the (US-South Korea) working group, it will now be possible to proceed as planned the groundbreaking ceremony linked to the inter-Korean railway project,“ Lee Do-hoon, the South’s top nuclear envoy, told reporters after a working group meeting with his US counterpart Stephen Biegun. The two Koreas agreed to hold a groundbreaking ceremony for cross-border railways and roads on Wednesday to implement an agreement reached between their leaders in September. The event itself is not subject to sanctions, but a waiver was necessary for materials the South plans to take to the North’s border town of Kaesong, where the ceremony is to be held. The divided Koreas will also continue pursuing a project to recover war remains inside the Demilitarized Zone, according to Biegun and Lee. The South and North plan to search for war remains from April to October next year as part of an inter-Korean military agreement reached between their defense ministers at September’s Pyongyang summit. There were concerns surrounding the list of materials to be transported to the DMZ for the project. An issue regarding providing North Korean citizens with Tamiflu, an antiviral medication, has also been resolved, Lee told reporters. The last time the Seoul government shipped Tamiflu to the communist state was in December 2009. Carrying out $8 million in humanitarian assistance to the North -- which the Moon Jae-in administration announced last year, but which has yet to materialize -- will be a subject of continued discussions with the North, according to Lee. Lee said the US has started to review whether the aid would be subject to United Nations sanctions against North Korea. Biegun said that humanitarian assistance to the North isn’t banned by the UN resolutions, but the issuance of travel permits and licenses to aid workers and others has to be further considered. He said the matter would be further discussed upon his return to Washington. He is scheduled to leave Seoul on Saturday. Biegun stressed that the US currently has no intentions to alleviate sanctions imposed on North Korea and would continue to seek ways to build trust with the communist state. The allies noted that they face a crucial moment in the coming months for the complete denuclearization of the peninsula and establishment of a peace regime, according to Lee. The allies agreed to work together for early working-level talks between Pyongyang and Washington.